Katana in Shirasaya with Koshirae. Habaki :Gold color single habaki. Blade length : 68.6 cm or 27.0inches. Sori :0.4cm or 0.15 inches. Width at the hamachi : 3.07cm or 1.20inches. Width at the Kissaki : 2.18 cm or 0.85inches. Kasane : 0.74cm or 0.29 inches. Shape : The blade is Machiouki with small sori and long Kissaki. Hamon :Niedeki suguha rather tight and bright, clear. Special feature:First generation Yosyu Kunimasa started from Kanbun era and continued to 6th generation. 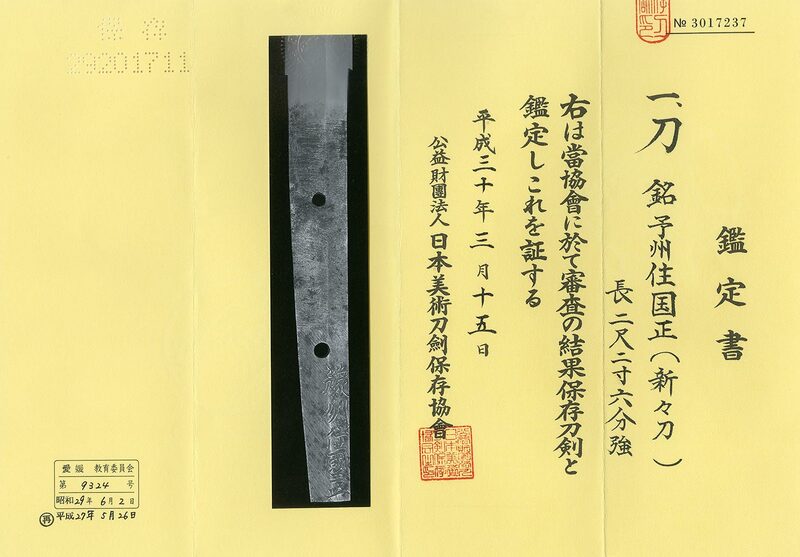 This sword looks 6th generation and studied under the Bizen Sukeharu. Tsuba :On the round shape iron tsuba, flower and grille design are engraved open work. Menuki : It looks like a dragon is engraved with gold color. Fuchikashira:On the syakudo plate, a peony flower is engraved with gold color. From Aoi Bijyutsu. The sword is slightly suriage but the Jigane is quite well grained and with nice polish was done. Koshirae is also nice Byakudan nuri good Koshirae. the blade is suitable for watching the blade and also Iai practice.